My favorite dessert of all time would have to be s’mores. I believe there are two reasons for this. The first reason would, of course, be the taste. Any good dessert has chocolate in it, so this obviously meets that criteria. I love the chocolate, the sweetness and texture of the marshmallow. And the graham cracker is the perfect tool to keep your hands reasonably clean, as well as add a little crunch! 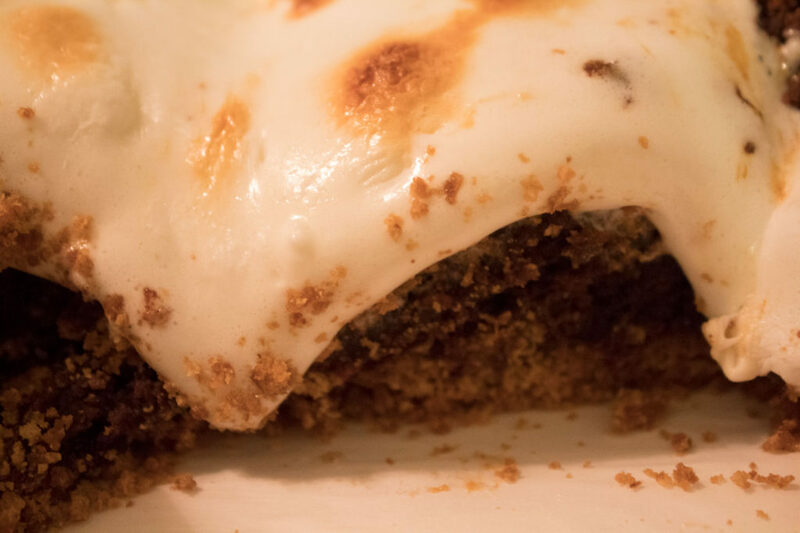 The second reason I love s’mores is the memories that accompany the dessert. Eating s’mores around the campfire with friends and family. 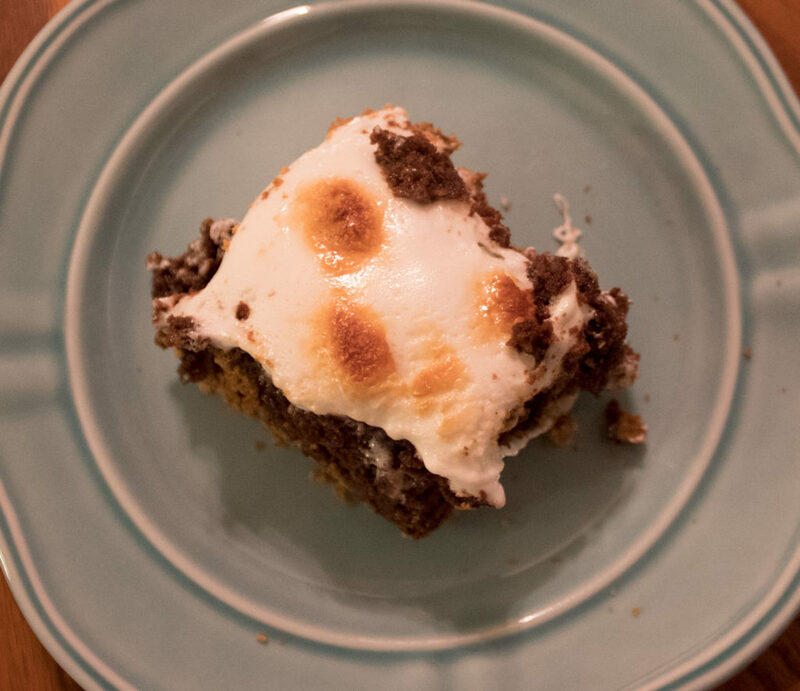 Eating a s’more always seems to be the sweet ending to a perfect night. I love s’mores so much that I actually had a s’mores bar at my wedding. It was such a sweet and simple moment to share this treat with our friends and family as the sun was setting over the ocean. 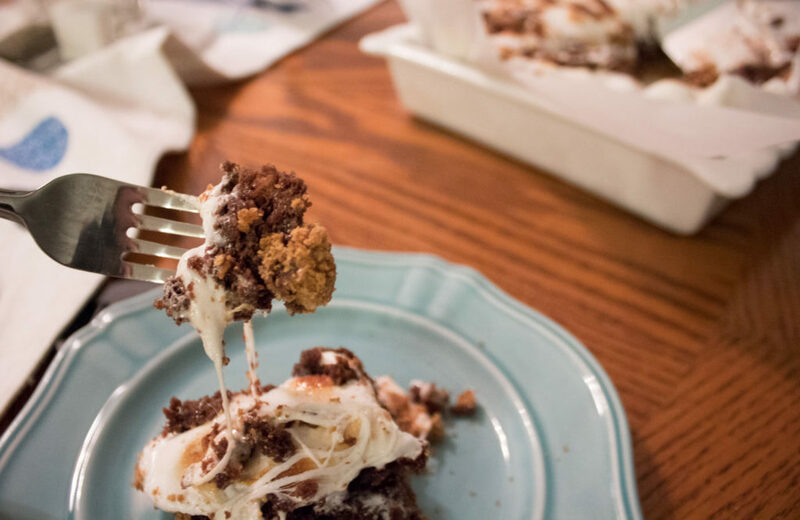 Now if that has not convinced you that s’mores are the greatest dessert, then you will have to try this recipe – which is just another great variation on the perfect dessert. While this may take a few more minutes than skewering a marshmallow and sliding it between chocolate and graham crackers, it is absolutely worth it. 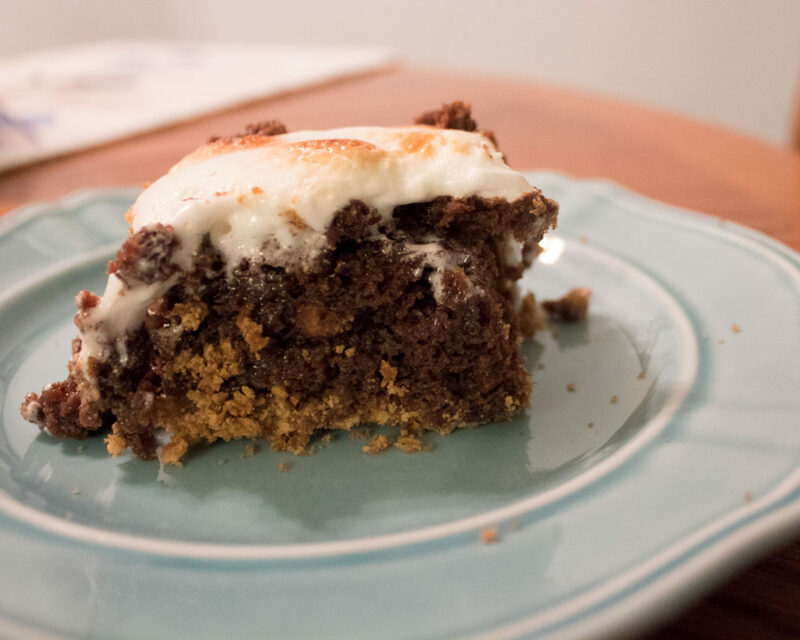 I have made this dessert twice in the last few weeks for different friends (none of which have any allergies), and no one even noticed that it was egg-free, dairy-free, and nut-free. I was even asked to make it again for the next barbecue! I do not say any of this to brag, but to assure that this recipe is worth the try! I hope you enjoy! 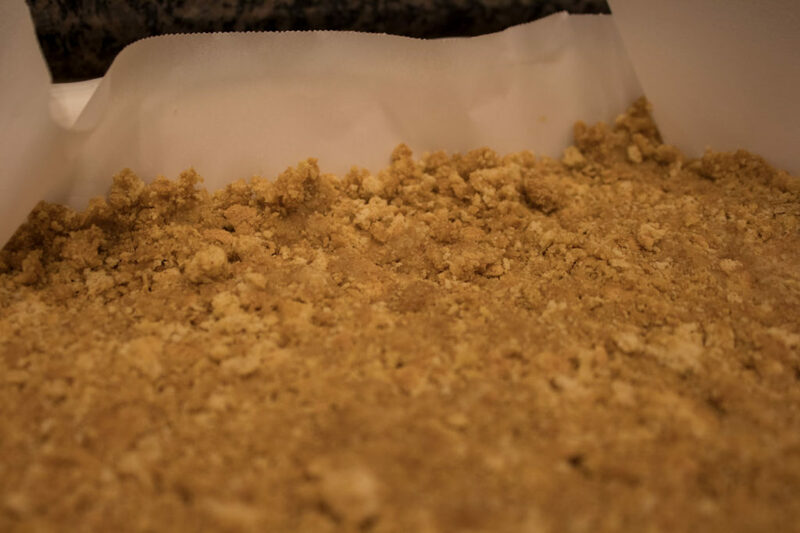 Preheat oven to 350 degrees F. Line an 8×8 baking dish with parchment paper. Mix graham crackers and melted non-dairy margarine in a bowl. Press firmly covering the bottom of baking dish. Place in freezer for 10-15 minutes. While the crust is freezing, mix together brownie ingredients in a mixing bowl. Take baking dish out of freezer. Pour brownie batter in dish over the graham cracker crust. Place in oven and bake for approximately 35 minutes. When brownies are done baking, take out of oven. Pour mini marshmallows over the top of the brownies. Turn the broil on place dish back in oven. Keep the dish in oven for approximately 2 minutes, or until the marshmallows melt and turn golden brown. 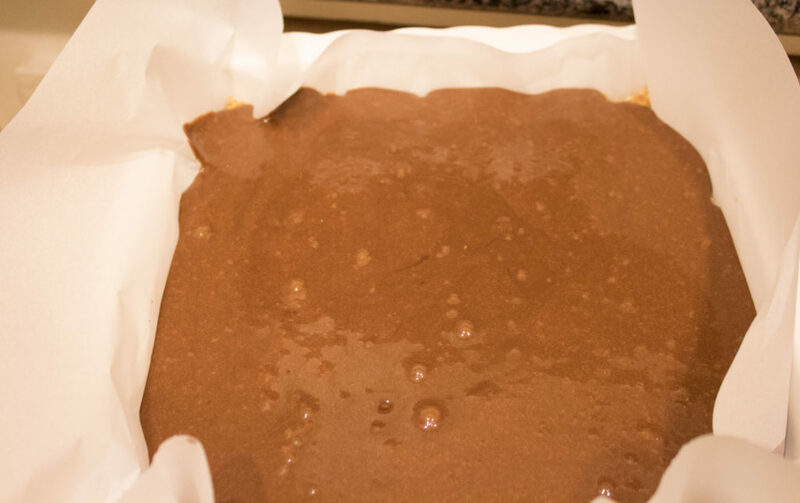 Give the brownies at least 10 minutes to cool, then enjoy!